The Wildlife Preserve at the Lighthouse, is an excellent spot for bird watching. 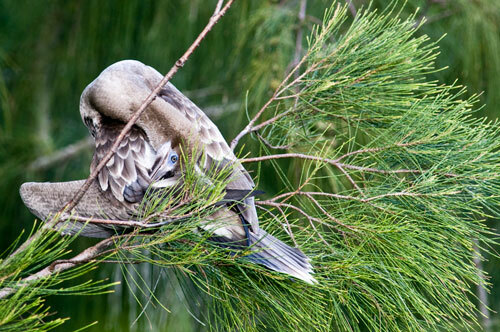 Here, a wedge-tailed shearwater contorts to clean its wing. 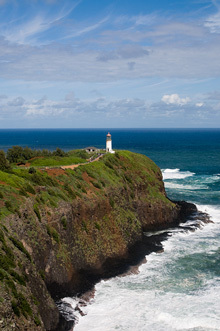 The Kilauea Lighthouse attracts more than a half-million visitors annually. Lighthouse: Built in 1913, the Kilauea Lighthouse is one of the few of its kind still standing in the state. For years, its light (which could be seen more than 20 miles out to sea) kept ships safe as they navigated waters along Hawaii’s northernmost point. Today, it attracts a different type of voyager in the form of a half-million tourists every year. More than 200 acres around the lighthouse have been converted into a wildlife refuge. The park is one of the state’s best for bird watching: The grounds are very walkable, and the views are spectacular, and the park offers binoculars for easier viewing. From the Hawaiian state bird, the Nene, to the huge frigate bird (whose wingspan is up to 8 feet wide), this is a tropical birder’s dream. Other species of seabird you’ll want to spot include the red-footed boobie (their nests can be seen along the cliffsides) and the Laysan albatross, too. A Laysan Albatross soars near the cliffs of the Kilauea Point National Wildlife Refuge. But the refuge isn’t just for bird watching. Aim your binoculars toward Moku’ae’ae Isle, just off the peninsula, to spot some of the monk seals that call its shores home. And if you’re visiting during the wintertime, you might even spot a few whales off the coast. This is the time of year, when families of massive humpbacks make their migration From Alaska to the waters around Hawaii to calve and mate. Watching a humpback whale breach is one of the most exciting displays of nature. The Japanese Cemetery of Kilauea is just off Kilauea Road on the way to the Lighthouse. Kong Lung: Speaking of out-of-the-ordinary animals, when you stop by Kong Lung Center, keep an eye out (and an ear open) for Daphne the Parrot. She’s a town institution that likes to hang out near the Kong Lung Trading store. There are a few other shop animals around Kong Lung waiting to make your acquaintance, too! International superstar Daphne the Parrot has fans around the world for her dancing and singing skills. Daphne can be found daily in the courtyard of the Historic Kong Lung Market Center doing her thing. You see, the businesses at Kong Lung Historic Market Center pride ourselves on personality and making everyone who walks through the courtyard feel like family. And no family would be complete without a few furry, feathered, or finned friends hanging around. It’s hard to find good help, so don’t be surprised don’t be surprised to find out that the customer service rep at one of our stores sleeps by the register (purring), or the security guard weighs only 20 lbs and patrols the restaurant grounds looking for table scraps.